Have you noticed the “Stop Out BC” social media movement? Launched by Beth Fairchild in March, the goal has been to leverage the combined influence of our social media reach to focus attention on MBC-specific issues and concerns. The effort has brought people across the country together – MBC patients, early stage patients, caregivers, supporters, and those who have lost loved ones the metastatic breast cancer. What impresses me most is the way it has brought together so many to lend greater attention to the 30% of breast cancer patients who will die of MBC. Awareness is, without a doubt, critical. 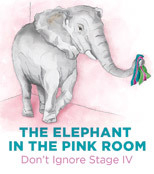 So much of our cultural attention has focused on early stage disease, early detection and “survivorship” that we’ve left many MBC patients feeling alienated and alone, as if we can’t bear to be in the presence – even the virtual presence – of those who will die from our disease. Standing with and supporting those who are living with, struggling through, and dying from breast cancer provides a lifeline out of the sense of isolation and hope that others will understand and help. However, awareness alone doesn’t prolong lives or end death from breast cancer. Many of us, myself included, have long rallied against awareness for its own sake within the context of early stage disease. I believe we must be mindful of this trap, too. The question must be asked: How do we move from awareness to action? I’m the president of METAvivor, so I can’t possibly miss the opportunity to pitch what we do and how we’re growing to meet the needs of the metastatic community. FUND: At our core, we fund research. We do so as the only American nonprofit that raises private funds to allocate through a competitive peer-review process. As I write this we are heading into our 2015 grant cycle. Approximately 50 applications are being reviewed. The focus of our grants is, exclusively, research that will benefit the already metastasized patient. And unique this year we will also be offering a grant for the development of a liver metastasis mouse model that will help researchers work toward improved treatments for those with liver mets. SUPPORT: METAvivor’s roots lie in mutual support amongst patients. In the coming months, with thanks to an Avon/Pfizer MBC grant, we will begin the process of creating a “best practices” and training program for those who would like to start a local, peer-led MBC support group in their own communities. PARTICIPATE: Whether by joining us at one of the many Sea to Sea for MBC stops on our journey across the country or by joining our team to spread information and education in your own community, you take a critical action step that makes a real difference in the lives of those living with MBC. LEAD: METAvivor is proud to be a leader among nonprofits working with and on behalf of MBC patients. As we expand our reach we welcome leadership in its many forms, from social media and organizing experience to development and management opportunities. Our team is expanding, and we would be thrilled to put your experience to work! METAvivor, of course, does not stand alone, and there are many other opportunities to migrate from awareness to action! Are you near a research center? Researchers appreciate connecting with patients. It provides opportunities to share and understand their work from the patient perspective, to get advice about patient needs and priorities, and to celebrate success with those who most readily understand. Pick up the phone, send an email, and introduce yourself! Share your story. You are (or your loved one is) the very face of metastatic breast cancer. Local media, local organizations, schools, and others are ready to learn from you. Hospitals, treatment centers and individual doctors and nurses can learn from you. Even those who work in at the very heart of cancer patient care don’t necessarily see life with metastatic cancer from the patient perspective. Look for opportunities to share it with you. Support a Support Center. Teach a class or volunteer in other ways, and help make sure they understand the specific and unique needs of metastatic patients. Previous 395 Sq. Ft. Next Why Advocate?